- Inner Harbor 6.8 Ounce Mainsail Short Sleeve 100% Ringspun Combed Cotton Piquè Polo With Pocket. - 2-button placket, welt cuffs and collar, left chest pocket, extended tail with side vents, woodtone buttons. 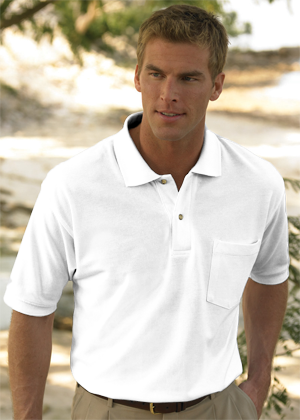 Inner Harbor 6.8 Ounce Mainsail Short Sleeve 100% Ringspun Combed Cotton Piquè Polo With Pocket. 2-button placket, welt cuffs and collar, left chest pocket, extended tail with side vents, woodtone buttons. Style Ships From Pageland, SC.Sizes S-3XL: White, Bimini Blue, Black, Burgundy, Hunter (No L, 3X), Navy, Red (S-L only), Royal.